Cloud Accounting Integration by Wise-Sync, launched directly from within ConnectWise Manage, delivers enhanced accounting integration to cloud accounting platforms Xero and QuickBooks Online (QBO). Developed by an MSP for MSPs, Wise-Sync took every accounting pain-point and created accounting-sync-topia. Now everyone can sync like a Ninja. Wise-Sync delivers a Ninja-like integration to cloud accounting platforms enhancing key business processes inside ConnectWise. Wise-Sync delivers efficiencies across the financial and administrative processes in your business, to deliver time and cost savings. Partners across the globe are changing the way they approach inefficient practices in admin cost centers with resource savings in the tens of thousands. Tried and tested with more than 100 - 5 Star Reviews - It's not easy to keep a perfect record; but we're proud of the product and evidence of our commitment is evident in the reviews right here on the ConnectWise Marketplace. 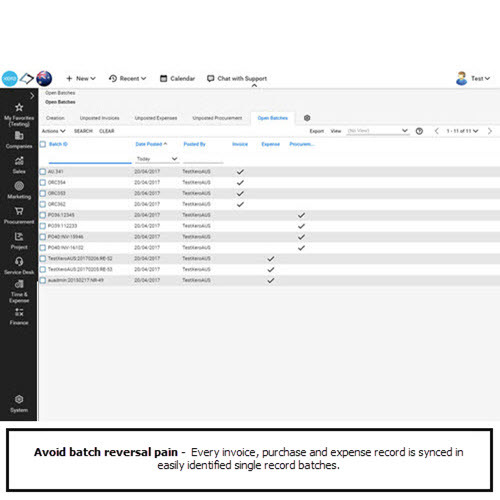 Single record batches - Every invoice, purchase and expense record is synced as an easily identified single record batch. No more correcting $0.01 invoices - With line and record validation, rounding is automatically applied to out of balance lines. Sync all your accounting data with the press of a button. Eliminate record errors- Every record is validated against business rules, including Tax and Invoice Amount Validation. Increase process efficiency -With Single record batching, part-shipments and full inventory accounting, all from within ConnectWise Manage means no more double -handling accounting transactions. Ash Cohen moved from Desktop Accounting Platform MYOB to Xero and immediately realized over 8 hours of recovered time in personally managing the 'Painful Sync' from ConnectWise. By implementing Wise-Sync for their two billing locations; it's cut the cost of administration down considerably. – Tech Head. View the Product Demonstration to view more Partner Stories on our website. Sync All Accounting Data - Sync all record types including detailed Invoices, Payments, Procurements (Purchase Orders), Inventory and Expenses. No line of detail is left behind. We even take some data types to the next level through our deep integration into 11 ConnectWise APIs. Secure Cloud Integration – No software to install and maintain; data only transmitted, never stored. Using only the ConnectWise APIs it is fully supported for Cloud and On Premise Partners. We even support ConnectWise Beta Partners. Built for Robust Financial Practices - Sync only quality data to your Accounting Package. Wise-Sync validates every record and will either warn of a compliance issue, or optionally halt a record from posting if it does not meet our defined compliance checks. ConnectWise Certified and Tested - We work directly with the ConnectWise API team, demonstrating the importance of the continued flow of critical financial data to your accounting platform. Wise-Sync has had Alpha Release support for all versions on average within 2 days of pre-release. If you need assistance with creating API members or integration setup please send a note to Help@ConnectWise.com and the ConnectWise Manage support team can assist. For any other questions with this integration, please contact the the Wise-Sync team directly to resolve any issues. We have been using Wise-Sync and Wise-Pay now for two months. We are long-time CW users but were doing all billing from a different system, and it was time to integrate everything. The Wise-Sync team has been amazing, and they really understand the entire end-to-end process. Paul and his team have all been invaluable in allowing us to make this transition. We now use CW and QBO exclusively and soon will be able to do accurate real-time financial reporting. We moved from a home grown PSA and Quickbooks Enterprise to CW and Xero. The integration and accuracy of Wise-sync and Wise-pay is phenomenal. We generate about 1000 invoices a month, and have roughly 30 bank/credit card accounts to reconcile and are closing our books on average 5 days after EOM. Paul and his team have been the most helpful group in our CW conversion. The product does everything as advertised, and the team is a wealth of knowledge. This is a must have app to integrate Xero. The team where very helpful during the project which was delivered on time and on budget. The capability is brilliant. Wise-Sync as a company and Paul MacNeill personally have been fantastic with our implementation and subsequent support (fortunately not often required!). I am no expert with the accounting side of ConnectWise, so their assistance with setup and getting everything mapped over correctly was excellent, and got us up and running in short order. Challenges have cropped up and the support has been fast and got the issue resolved. In short, you could not ask for anything more from a supplier! Great Product that fills a disappointing gap between Xero and Connectwise Manage. the team at Wise-Sync understand Connectwise, Xero, and the MSP industry very well. Still loving this product. CFO doesn't know what to do with all the spare time Wise Sync has given back to our business. If you aren't running Wise-Sync integration, I feel sorry for you. Been using Wise-Sync (Xero integration) for +12 months and it works brilliantly. Ive used many systems over the years, the level of integration, seamlessly working in the back ground the way I need it to is bar none. Support is there when I need it - cant fault the product. We are a +100 staff company. I installed WiseSync with Xero around 5 months ago and it's already paying huge dividends in our financial accuracy and debt collection. It takes the pain out of the ConnectWise integration. We are currently use the invoices, payments and expenses functions. I can't recommend this product enough, it saves you so much time not doing the low-value finance tasks. Next step, procurement. The WiseSync team are great too. We have been using Wise-Sync for over a year we are using with QBO, and love it. It works great and has really helped us to clean up our sync process. Support is also great and one of the initial reason I ended up with Wise-Sync over the competitor. We have recently had the pleasure of working with Wise-Sync. Both the company and the consultant we worked with were very professional and supportive with our move from QuickBooks to Xero. A great company and would highly recommend working with them. As a result of the Wise-Sync and Xero implementation we have saved 4 man days a month and have also been able to streamline our processes. We moved to Wise-Sync some time ago in an effort to streamline some of our administration. We have since built on this with additional automation and reporting which has enabled our business to scale significantly without having to add further resources to administration. My accounts person was going to leave due to the amount of repetitive work she was doing, So I moved to Xero and got wise-sync. Now her job is much easier, and even though the volume of invoices has increased significantly she can still complete everything in the same time. The choice between paying a monthly fee for wise sync or paying my accounts resource to work more hours each week was not a difficult one. We’ve partnered with only the best software and hardware vendors, and are plugged in to an international ecosystem of service delivery partners through EOS, Connectwise and HTG Peergroups. We are a great advocate of the vendors that we trust and hope that our partners feel the same way. Wise-Sync has simplified our accounting, streamlined reporting and led to countless savings in administration time. Before moving to Wise-Sync we suffered from Invalid Data transferred to Accounting; Painful Procurement; Information Double Entry and Inventory Management Nightmares, just to name a few. Wise-Sync helped us onboard to Xero, taking us from 19th century accounting right to 21st and beyond. Wise-Sync helps us to have up to the minute financial visibility and better access to current cash flow. It is an all around better software experience than native integration to QuickBooks Desktop. Great support. Very willing to work with us through our issues. Don't bother with the other "accounting integrations" out there - they don't work well. Once you see how well Wise-Sync works, and the details they have thought of, you'll be blown away. We used the cw-owned solution for a while and had nothing but problems. Wise-sync has people with actual accounting experience that designed it, and do the setup for you. They hand-hold you through the implementation process. They even have workflows for the shortcomings within CW. Worth every cent. High Altitude take-away = Wise-Sync is one of the best choices we have ever made for our company. -- Their trainer was a previous controller for a large MSP. Learned far more about being efficient with CW than we did with CW directly. -- Everything syncs flawlessly with Xero. Back AND forth. Our team never has to leave CW for any billing question or issue. -- Our contracts auto-pay us every month. We used to use QBO to do this. So so effortful... Wise-Sync does it all with a click. We have been using Wise-Sync for almost 6 months now and it really is very good. The few problems we have had have been sorted very quickly by Paul. Excellent customer service. Excellent product! Justin Doxford, Advantage Technologies, Inc.
We were previously using Quickbooks, and made the switch to Xero + Wise Sync 1.5years ago. After some initial hiccups (Support was excellent from Paul and his team!) with the implementation, the products works not only as advertised, but has far exceeded my expectations with the simplicity and support from the Wise team. We are also excited to see what else is in store from the Wise team and look forward to working and growing together! Keep up the great work Paul+Wise and Virage Team! We've been using Wise-Sync since February 2014 and the product combined with ConnectWise and Xero has completely changed the way we do business. As a result of being able to sync all of our financial data form ConnectWise into Xero we're more efficient and have more visibility over our companies performance than ever before. Using ConnectWise to the capacity in which we do and utilising a sound, reliable accounting package in Xero would not possible without Wise-Sync. Wise-Sync is an outstanding piece of software and well supported. Guido Garcia, G2 IT Solutions, Inc. Product has allowed our business to continue to grow without having to dedicate additional resources to administration and accounting by facilitating direct integration with the accounting platform. Managing AR and AP has become a breeze. We have used Wise-Sync for over 2 years now. It is an excellent product. The team is always looking for ways to improve it and are happy to help out. Without this integration we would be wasting numerous hours on our accounts side! Get on board and revolutionize your finance syncing! Wise-sync has been key to our success in transitioning away from QB to Xero. Paul and his team continue to be very supportive in helping us improve our financial processes. Highly recommend the product and the team behind the brand. Paul and his team have been instrumental in implementation of our CW financial data integration with XERO. Not only the implementation was a complete process overhaul and improvement, but a key factor in our path to complete invoicing and client direct debiting automation. Its been a great tool for us. Much easier to implement than expected. Since starting to use it, can't imagine going without it. We had long identified the need to move off our legacy accounting package onto one of the newer generation cloud based options. Once we discovered Wise-Sync the decision was made, and we haven't looked back. The integration between Connectwise and our accounting package is seamless, and far deeper than any previous or native integrations we have used or assessed. Since implementing Wise-Sync we have been able to automate and streamline more parts of our business than ever before. Fantastic product and support from Wise-Sync! We previously used MYOB and manually entered connectwise generated invoices into the application. But after consulting with Wise-sync we decided to move to Xero and utilise Wise-sync to remove the manual work we were previously doing. The support team during the integration were fantastic and very helpful. I would recommend wise-sync to anyone currently using Xero or thinking of moving to Xero. 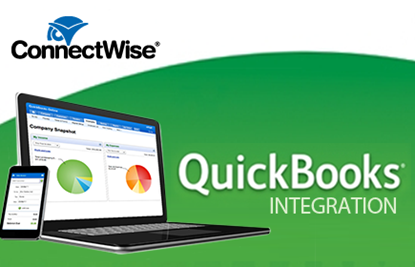 Love this integration with QuickBooks it has made our lives so much easier and works seamlessly with ConnectWise. Highly recommend. ***BUSINESS OWNER PERSPECTIVE*** All I know is that since switching to Wisesync from a competitor The screams of frustration coming from the accounts team office are vastly reduced. I no longer get knifed by angry accounts people every time I need to upgrade / return equipment that has already been sold and invoiced to a customer. They have taken down the photo of me that was stuck to the dart board on the back of the door and replaced it with Ingram Micro's Corporate Logo. Wise-Sync has been a huge time saver for us and enabled us to focus our efforts and resources where they are bestutilised. The tool is simple and effective. The team are great and we feel well supported. I have a review below but thought I would update with how things are going now that we have been with Wise-Sync for a couple of years- we still love it! Anytime we do have an issue the support is prompt- although the system just works with very little management and the issues normally come from either user error or connectwise updates not wise sync! We went from manually copying and pasting entries from ConnectWise into our accounting package (ridiculously time consuming!) to deploying a different integration package which screwed up our accounts. Since we deployed WiseSync everything has just worked. It saves so much time and effort. Our accounting system is always up to date, always accurate, and we've probably saved 2 full time admin days per week. We have been using Wise-Sync since July 2015. First I have to say it would not be possible to use Xero and ConnectWise without this tool. It simplifies our lives and the functionality is top notch. Any issues we come across support is super responsive and 90% of the time they have already created a step by step KB to walk us through resolving it ourselves. I would highly recommend this product. David Park, Xterra Solutions Inc.
Virage is the bomb! QuickBooks to Xero Migration - Check! Wise-Sync Ease of Use - Check! MSP Knowledgeable Team - Check! SLI and HTG Reporting - Check! Solid Services Team and Fantastic Support - Check! I love this team and what they do. -David J. Park, CEO Xterra Solutions, Inc.
Best decision ever! We moved to Xero 2 weeks before EOFY, can you believe? Then also started using Wise-Sync and Wise-Pay. The transition was as smooth as you can get. With the help of Paul, Di & the team at Wise-Sync, I felt at ease and very confident with the move. They know this product so well and can handle any question or query you have for them.' Sync with sales and purchases is seamless and so quick. Auto-payments in Wise-Pay is a breeze. Thank you very much, guys. Jenny Ung, Xterra Solutions Inc.
Long story short, we decided to migrate our back office to Xero and use Wise Sync (and Wise Pay) to integrate with Xero. While my impressions of Xero are not glowing (some really whacky stuff we've had to deal with), Wise Sync has been excellent, pushing data across without a hitch and turning our invoicing from something we dreaded doing to a total breeze. We had used a number of other products to sync invoices from CW to Xero and they were all extremely painful to use and manage. We have been using Wise-Sync now for 18 months without any complaints or issues. The application has an abundance of additional features to any of the other products that integrate to Xero. Including syncing all invoices, purchases / procurement, expenses, and payments from Xero. Awesome product and we highly recommend this to any Xero user. Worth the monthly fee. I have been with Mangano IT since February 2016 who were already using both Wise Sync and Wise Pay. These systems streamline the invoicing/accounting/payment process. If there is ever a problem, the team are available and work with me to fix the issue quickly. If you are looking for a company with great support and a vision to minimise unnecessary double entry, this is the company for you. Wise-Sync is simple to use and has saved used numerous hours per week. During implementation we purchased onboarding services, which was worth every penny. Wise-Sync consulting team quickly understood our requirements and helped us to make best use of ConnectWise with a particular focus upon the Inventory module. I highly recommend Wise Sync for any ConnectWise partner and if you are not already using Xero. It will be one of the best business decisions you have ever make! – it was for us. We have been using Wise-Sync to integrate between ConnectWise and Xero and couldn't be happier with the product. It does exactly what it is meant to do It saves us a considerable amount of time each month with 100% accuracy. Equally so, the support provided by Paul and the Wise-Sync team is world class. They take ownership of any requests and provide swift action to resolve any issues. I couldn't ask for more from a product and integration partner. Keep up the great effort team. Having implemented Wise-Sync twice at JEM and the last company I worked for, and I would do it again and again. Words cannot express how awesome the team at Wise-Sync are I would highly recommend everyone takes the leap to using Wise-Sync for integration with CW and Xero. The integration has given my team the ability to invoice out all chargeable jobs and invoice on a daily basis with ease and accuracy. The after implementation support and knowledge have ensured a smooth transition. As an early adopter of Wise-Synch, I have seen this product evolve over time. It performs all promised integration tasks with precision. Wise-Synch is the ideal "glue" for ConnectWise / Xero users. But to be fair when when you sign up, that's what you expect. The real differentiator for these guys is their outstanding customer support, personal, prompt and proactive. Five+ stars for me! We use Wise-Sync to transfer our invoices over to Quickbooks Online and our payments back from Quickbooks online. After a small amount of setup and configuration, Wise-Sync has been working perfectly for us. We especially like the single record batching as it makes it much easier to go back and adjust something after the fact. 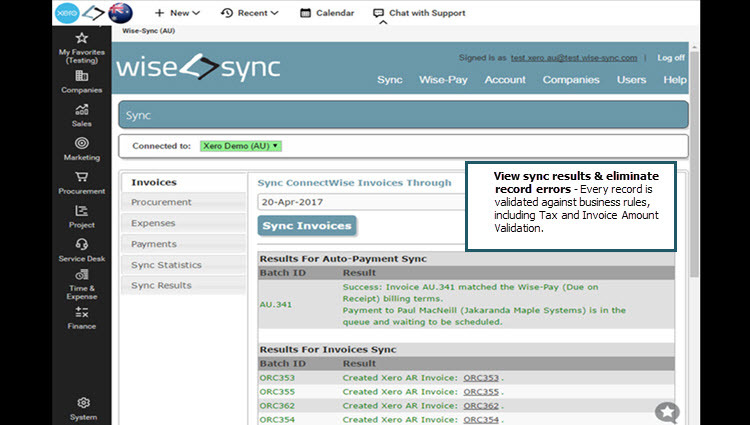 We moved from Quickbooks to Xero 5 months ago and started using Wise-Sync to synchronize ConnectWise to Xero. The transition to Xero was seamless thanks to Wise-Sync. Our day to day processes are now a breeze and my accounts person has clawed back 1.5 days a week single record batching saved her life. WiseSync is #%$@ing AWESOME. Working with Wise-sync is just a dream. Nobody has put up with my level of stupidity as brilliantly as Paul and his team have. I probably would have smashed my computer by now if it wasn't for his useful links and videos. I can honestly say that I am progressively getting smarter each day because of Wise-sync. No mistake is to big - Thanks guys we love you! Matt Cann, Max. I.T. Consulting Services Pty. Ltd.
We have only been using for 2 months, and there are so many benefits, I wish we had started using Wise-Sync sooner! Invoice amounts are sent across to Xero with no data entry errors and no 1 cent discrepancies, and single record batching makes it incredibly easy to adjust individual invoices. I love that payment syncing marks the invoices as paid in ConnectWise, so all our staff have up to date information about who paid, even staff without access to Xero, so fewer awkward phone calls. Now that we are set up, we are saving hours every week. UDIT has only just started using the Wise Sync software and we have already seen a great change in eliminating manually creating invoices, bills and expenses in our accounting software. UDIT setup the software integration independently by following documentation provided by CW and Wise Sync. With the assistance of email support we were able to setup Wise Sync with ease and patience from the support team answering all questions. We converted from MYOB to Xero just one week ago. We made this decision after Paul MacNeill showed us some of the features of Xero that have revolutionized his business. There was no question about implementing Wise-Sync simultaneously. The setup with Wise-Sync was quick, easy and professional. We were syncing invoices and payments within a matter of days and with ease. We have no hesitation in recommending this product to anyone thinking about making the move. Jason Volmut, CPU Rx, Inc.
We're a small firm of 10 staff and have been using ConnectWise for 4 years. We recently migrated from QuickBooks on-prem to QB Online. We've had our eye on Wise-sync since IT Nation 2014 and after completing a successful integration with ConnectWise, QBO, Wise-Sync & Wise-Pay, I'm delighted to finally feel we've unlocked the full potential of CW as our business operating system. Wise-Sync does more than save clicks and improve operational efficiencies, their solutions are backed by a world class team of consultants (thanks, Paul! ), with a genuine desire to help build leaner, more profitable businesses. I'm amazed at how simple the management of finance has become. Wise-Sync works great! I was able to get it fully set up and syncing transactions in less than an hour. What's more, is that it has allowed us to leave the stone age (QuickBooks) and finally re-join the future (Xero). Paul and team have been super helpful and responsive as we've had questions. 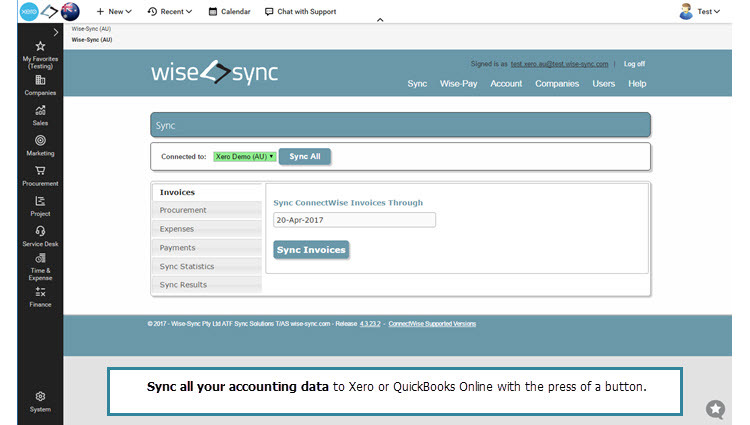 I'd recommend all MSPs look into ditching QuickBooks and move to Xero using Wise-Sync to connect Xero with ConnectWise. I have been a Connectwise User for years and a Quickbooks user for almost as long. The built-in Connectwise Accounting Interface was never as reliable as we wanted it to be. By switching to Xero and signing up with Wise-Sync, we have finally found the solution we have been looking for. Wise-Sync simply does the accounting integration the way it should be done. 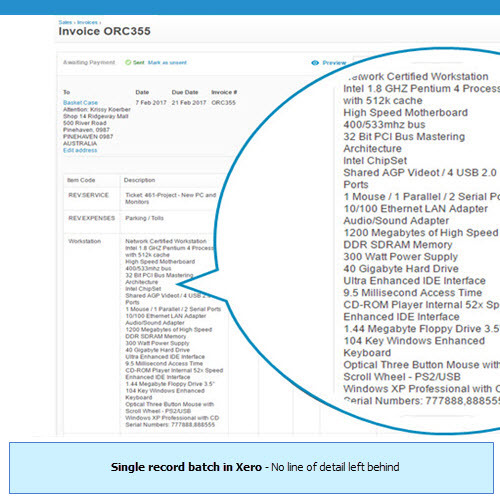 Each invoice is batched to Xero as a single Batch in CW. This means that if you need to delete an invoice, you aren't having to delete the entire batch in CW. Wise-Sync support has been an excellent resource in helping us transition to Xero and teaching us the best practices for CW and accounting integration. Brilliant support! Great improvement to our workflow. But again, the support was outstanding! I cannot speak more highly of this product. WiseSync has delivered on EVRYTHING it promises and more, which is so rare in business these days. So Why Change? This is a question we asked ourselves on numerous occasions. 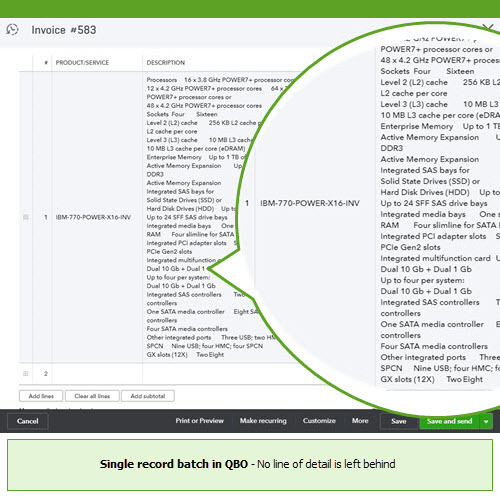 We lamented the need to change from the Native (ConnectWise Supported) QuickBooks Enterprise, to an external integration tool. Like many business it was imperative that we see the ‘direct benefits’, as this change would require paying for a third-party integration subscription as well as higher-cost accounting package than we were paying for QB. In order for this application to really serve our business needs, it needed to deliver a significant improvement to our accounting processes; as well as provide a capability that could not be achieved with the QB integration; a tough act to follow. The resulting outcomes were nothing short of Amazing, every facet of the application has been built with the MSP in mind, delivering several process efficiencies that we would not even have thought of. Single Record Batching is just one of those marvels. A few key areas in which our business has greatly benefitted: • Increased productivity - improved efficiencies with features like the seamless daily bank account reconciliations, and direct integration from WHMCS billing platform into Xero, has afforded us the freedom not to hire another accounts resource. • Instant financial snap shots – with everything synching, we have been able to make more informed ‘real time’ business decisions knowing our current state of play at all times. • Time Savings – the ease of preparation of the Service Leadership reports with the new formatted report and accounts that automatically align to SLI, has been a huge time saver. • Support – error messages that actually mean something! For end users this is invaluable. Also, providing near instant resolution to issues encountered makes the WiseSync Support team a pleasant and impressive feature. In short, this product has delivered not only on the promise of substantial time savings, but in real terms has saved us in the vicinity of $50k a year in improved efficiencies. It is one of the best financial and business decisions we have made. Wise-Sync has made our lives so much more productive. Paul did our implementation along with the assistance of another couple of his staff when needed. He is a life saver and has the patience of a saint. I am not the easiest person to do an implementation with and admit freely to that fact, but Paul was very patient with my multitude of questions, sometimes the same question asked more than once if I happened to forget the answer or needed it explained in a different way. Being able to sync the data from ConnectWise to Xero has made things flow so much better than they did from ConnectWise to QuickBooks that we were using till the changeover in July 2014. I had started the implementation myself, but once Paul realised the depth of information that we really wanted from the data he suggested scrapping the original set-up and going with a new one almost from scratch. We were moving to Xero as newbies so took his advice and I am so glad that we did. He knows his stuff that is for sure. I couldn't recommend Paul and his team highly enough. Help is only an email away and the response times are brilliant too. Aside from the expertise of their work, they are also a very friendly bunch of people to work with. Thank you from a very happy Wise-Sync client. Doing monthly invoices via templates in QuickBooks Online was a time saver (over manually entering every single invoice) – but I still had to be sure the number matched my invoice number in Connectwise and be sure any other fields were updated appropriately. Then the other invoices still had to be entered line by line manually and was susceptible to errors. With Wise-Sync – it’s fast, easy, and accurate. The other times aver was getting payments back into Connectwise from QuickBooks Online. I would update the payments manually in Connectwise if it was required for some reason, but otherwise, all the receipts for accounting was done in QBO and if the owner was looking at the billing done in Connectwise – he didn’t know that if the client owed us money or not. Now payments flow back into Connectwise and everyone is kept up to date – and the only manual process is to click the “SYNC” button! The WiseSync team took extra time to be sure the unique way we use tracking classes and HTG account numbers in QuickBooks Online were addressed properly in Connectwise and that things ran smoothly from the beginning. It’s just as simple as the integration with the desktop version of QuickBooks! I would encourage anyone using QuickBooks Online and Connectwise to try Wise-Sync! 5 Stars from me – a REAL time saver! Wise Sync has been a great addition to our business, helping with streamlining our accounting process. I have found their service and support to be excellent and would highly recommend all CW users considering Xero to use Wise Sync. We were recommended Wise-Sync by our integration specialist. From everything that I have seen and talking to others, wise-sync is one of the "killer" features of CW. Every other product which does GL mapping to various other packages just seems to be hit-and-miss. It's easy to use, and it just works. We couldnt ask for more! I can highly recommend wise-sync as an integration tool for ConnectWise and Xero. We moved from another integration program and the move was seamless and extremely quick. Paul was extremely helpful and had an in-depth knowledge of both programs. Using wise-sync is simple and quick and we have had no issues since it's installation. 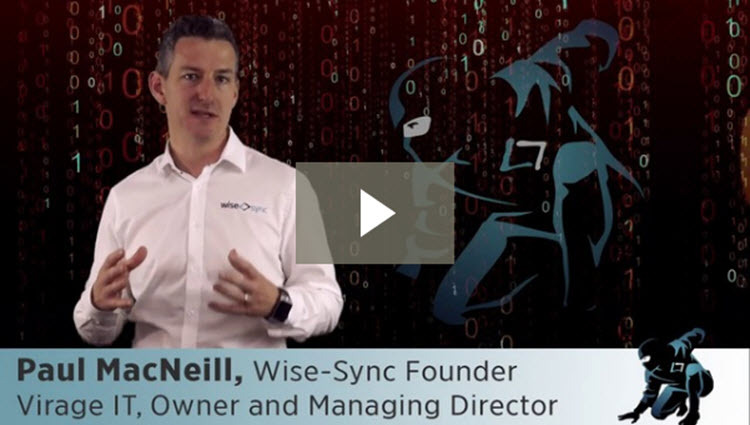 Wise-Sync was not the easiest product to setup due to the depth of integration with ConnectWise and Xero. The support during and after setup has been excellent however, so the challenges were overcome and we even helped in the product development in a minor way! The results of having integrated invoicing and payments between the two systems means we can cut down on doing lookups separately and we can see at a glance what state the account is in from ConnectWise. Great product, with an even better support team behind it. Could not recommend them more highly. Jackie Barnes, Precision IT PTY Ltd.
Wise-sync has saved me hours of data entry, hassle free and fantastic personalised support if you need it. After other products failed here Wise-sync was a great choice. If your not using it, you should be. We moved to ConnectWise, Xero and WiseSync in February 2014. WiseSync was the one piece of the puzzle that allowed us to seamlessly integrate our business management platform with our accounting package. Without WiseSync, I can’t imagine the administrative overhead and inefficiencies our business would experience. WiseSync in conjunction with ConnectWise and Xero have resulted in the redundancy of many time consuming and labour intensive accounting processes, which have consequently taken our business from strength-to-strength. Not only is WiseSync easy to use, but their online support is the best I’ve experienced. In addition, their knowledge base is incredibly well updated, meaning you can often find the answer you’re looking for without having to log a support call. If you're using ConnectWise and Xero then you have to have WiseSync. Great product that saves us time and money. Does exactly what it says it will do, and its Simple to use. Integrates brilliantly with Connectwise and the support is Awesome! We used to have one of the competitors nasty and expensive integration in place before moving to Wise-Sync. If only we had moved earlier and put all that time into Wise-Sync we would have saved 50 hours and a pile of heartache. Just make sure you allocate a good amount of time to setup and map your GL codes properly from your quoting system, right through to Xero. Once it's done, it works a treat! A must have piece of software for any ConnectWise and Xero user. We spent a bit of time with Paul tonight with such a success in getting wise-sync installed and working to our companies requirements, all around they are very useful and absolutely knowledgeable and we would suggest this product to everybody. Wise Sync does several things that i was not aware of before they where pointed out by Paul today, such as individual tracking codes on locations to track your income by automatically adding tracking codes to the exported invoices. The level of information that gets transferred is perfect and concise and the sync process has been well thought out in a workflow manner to prevent any issues, this was a big change for us as our old sync program for another program had haunted us for years with errors. The assistance given was late at night for them and was much appreciated as now we do not need to spend on extra data entry time to get our information from Connectwise to Xero. We will look forward to many years of great service from Wise-Sync. We have been using Wise-Sync for a couple of months since moving to Xero. It is a great product - nice clean interface, effortless to use and, once you get the set-up correct, it does just what you want it to do. Paul and his team have been very helpful throughout and are dedicated to making this tool the best it can possibly be. Two days ago we encountered a rare glitch with our syncing of invoices. We sent a support request and within a day they had investigated it, identified the cause and rolled out an update to fix it. Simply can't get better than that. Great product, this really does solve the issues with getting your data out to Xero without having to double handle everything, support is fantastic, happy to answer questions & solve any issue super fast. We were initially skeptical about the price increase moving from Quickbooks to Xero. Xero was going to increase our yearly accounts software costs by more than 3 times (due to xero cost and integration costs with Wise-Sync). However we have made the change and we have not been happier! Although the accounts costs are higher, having Xero and Wise-Sync we have saved numerous hours per month which greatly outway the additional costs! This has been a great move! The Wise-Sync team have been extremely helpful and very responsive (even contacting me within an hour after logging a support request at 6:30pm) We had a sync issue with a certain item and within 2 days Wise-Sync had fixed the code and released a new version to resolve the issue and let me know. I would highly recommend getting Xero and Wise-Sync. If you have any hesitations and you currently use Quickbooks or MYOB, MAKE THE MOVE NOW! We have just started using Wise-Sync and IT-IS-GREAT. if you spend a little time on proper preparation of Connectwise you can you will get exactly what you need out of it. Support dusring the setup process is phenomenal and pretty much instant. Cannot recommend it enough. A small step for man, a Giant step for Connectwise! It certainly couldn't be hard to improve on the QB batching process but WOW... this stuff just works. It has the attention to detail and actual requirements programmed into this nifty little app that make a real difference and you can tell the developers really listen to their clients. Support for our teething issues have been nothing but positive. I have no questions to the value this has added to the efficiencies of our business. Thanks guys. Wise-Sync has solved my ConnectWise and Xero marriage to the point that I no longer need to stress about it! I made my move from an MYOB solution which was clunky and unreliable to Wise-Sync - and it just works! It's easy to use, does everything it says it does (especially the payments sync which is great for those who utilise the CW portal) and the single record batching is a blessing in disguise (for me, who is new to CW and makes the odd mistake - single batching means I just fix the one error and re-sync the one batch - it doesn't effect anything else I did that day!). Support is fantastic, and fast too! Awesome solution and awesome people! Fantastic Product, made the whole integration straight forward and was a very thought out implementation. We started using ConnectWise mid 2013 and at the same time moved onto Zero. We very quickly realised we required integration between the two systems and Paul worked with us to implement WiseSynch. Paul is very knowledgeable, proactive and patient. His training even extended to helping us with both the Zero and the ConnectWise apps to get the required result for our business. His understanding in this area is fantastic and he's very passionate about what he does. We have found WiseSynch setup, knowledge base and documentation really good and easy to understand. I recommend anyone who is using ConnectWise to use the team @ Virage IT. Geoff Boyce, Precision IT PTY Ltd.
We have been using Wise-Sync for nearly 6 months now and can easily say that it is the best accounting package sync tool we have used to date. Invoice and PO data transfers are 100% accurate every month, and the support we have received to date has been excellent. Our accounts process is now simple, quick and painless since switching from the archaic MYOB product range to Xero and Wise-Sync and the best thing is that some of the upcoming features from Wise-Sync are going to make my life even easier! We have been using wise-sync for 3 months. I had been wanted to move from MYOB to Xero for about 12 months, but it wasn't until Paul MacNeill from Wise-Sync showed me the difference it had made to his business and how easy it was to setup Wise-sync. We have needed some help along the way to get the setup right and Paul has been very helpful. After 1st July we will be taking up the procurement offering in Connectwise, so our purchases will be pushed straight to Xero, and we wouldn't be able to this without wise-sync. I am very happy to be using Xero now and the partnership with wise-sync has been great. Get your free copy of Six Ways To Increase The Value of Your Growing MSP from Wise-Sync. This e-guide offers you the most practical ways to positively drive your MSP valuation.